Elounda’s name, stems from the ancient Olous, to become Olounda and finally nowadays Elounda. This ancient part of Crete, had been literally walked by astronauts to pop stars. Elounda is a slow paced, picturesque, fishing village, blending ancient memories with contemporary living and mouth watering Cretan gastronomy with crystal clear secluded beaches and warm hearted local people. It is naturally protected by mountain Oxia while enjoying the beautiful shore of Mirabello Bay at the same time. Its small harbor with its traditionally painted boats is surrounded by shops, taverns and cafes where you can sit and gaze a slow paced world, going by. You will experience that carnal time does not apply here! 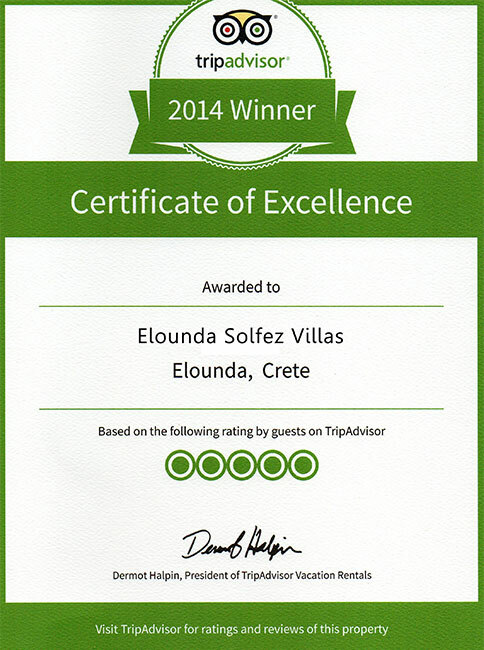 Closest sandy beach to your villa is in Elounda, only 2km away, a pleasant five minutes drive with your car. It has the "Blue Flag" award from the European Union for its clear and very safe waters for children to swim in. In Elounda, there is practically nothing you will ask and will not find. The same goes for the surrounding areas. Either you wish to relax at your villa's veranda or terrace, just gazing at the azure sea of Mirabello Bay, to clubbing and dancing at the nearby city of Agios Nikolaos (10 km). One should not miss visiting the historic islet of Spinalonga, in close proximity to the village.